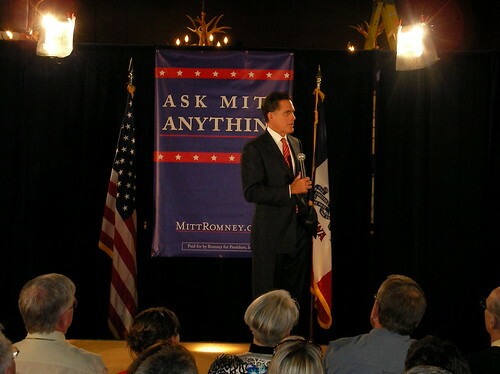 Mitt Romney campaigning in Ames, Iowa, May 2007. What we have today in the world is four major, if you will, strategies at play. One, there are the nations with the energy, like Russia. They’re trying to use energy as a way to take over the world. Then there’s China, which is saying, “We’re going to use communism plus sort of a Wild West form of — of free enterprise. We’re going to give nuclear weapons to — or nuclear technology to the Iranians. We’re going to buy oil from the Sudanese.” You’ve got China. And this great battle is going — going on right now, and it’s essential for us to strengthen other friends like ourselves and to confront one by one these other strategies and help turn them towards modernity, so that the world our kids inherit does not have to know war. Romney has had several years to educate himself on what’s really going on in the world, especially on nuclear weapons issues. If Romney’s the best that New START opponents have to offer, then they’re doing it wrong. I’m talking, of course, about Romney’s Washington Post editorial today, in which he blunders through a stale, much-debunked series of arguments against the New START treaty. I’ve said before that one of the simplest and clearest ways to look at New START is as a maintenance agreement. It’s a treaty that essentially has to be renewed periodically; it’s to everyone’s advantage, in all kinds of ways, that the treaty be ratified. New START ratification has received strong support from military and national security experts alike. So I’m not entirely clear what school of foreign policy Romney is from, except it’s one that rejects what the military and national security strategists say and calls signing the latest version of a critical, decades-old treaty “Obama’s worst foreign-policy mistake“. [President Obama] acceded to Russia’s No. 1 foreign policy objective, the abandonment of our Europe-based missile defense program, and obtained nothing whatsoever in return. Despite all of this, the president’s New Strategic Arms Reduction Treaty (New-START) with Russia could be his worst foreign policy mistake yet. The treaty as submitted to the Senate should not be ratified. He goes on to make a series of claims that were Heritage Foundation talking points several months ago, and have been roundly debunked in the Senate Foreign Relations Committee hearings as well as by analysts and policy wonks multiple times over, including a nice post from the folks at CSIS today. It’s not worth going through all of Romney’s statements, except to say that it’s interesting he should focus on the “New START limits missile defense” canard when Heritage has moved on to a more subtle argument about New START not providing adequate verification parameters. Clearly Romney didn’t get the memo that it’s time to shift to a new talking point. What’s more interesting is the bigger picture here: Romney is obviously clinging to the political fringe on foreign policy, and sadly, the Washington Post has given him a prime online real estate location from which to broadcast his ignorance. Ultimately, this points to the possibility (probability?) that Romney will be running for president again, and he’s trying to shore up credibility. The key word there is “trying”. With this editorial, he’s landed firmly in the camp that opposes all strategic advice, from STRATCOM to the head of the Missile Defense Agency, to George W. Bush’s national security adviser. He’s aligned himself with extremists who have no interest in stabilizing international relations, but he’s done it in such a ham-handed way that his fellow isolationist, anti-treaty conservatives at Heritage and the John Birch Society must be cringing. Finally, I’d like to point out just one more example of how far out of the mainstream Mitt Romney is when it comes to arms control and nuclear weapons discussions. In 2008, he went on CNN and said that nuclear non-proliferation was a “liberal” idea. I wonder what Senator Richard Lugar (R-IN), Henry Kissinger, George Shultz, and a host of other conservative nuclear non-proliferation/arms control veterans think of that claim? This entry was posted in New START, Nuclear Weapons and tagged Mitt Romney, New START, Strategic Arms Reduction Treaty. Bookmark the permalink. Post a comment or leave a trackback: Trackback URL. Your knowledge of the subject prevents you from seeing that what Romney is peddling exactly the sort of hype and lies which gathers a strong response from republicans. Reality is not desired when it conflicts with the beliefs of the ideologically pure. Nor will anything which conflicts with Fox News be entertained. Romney is spewing what will work for him. He is no fool, he is a self-promoter who will abandon decency at the whiff of gain. He’s definitely a self-promoter. I disagree about the “fool” part. He’s definitely that. But we’re getting off-topic there… Thanks for your comment. I apologize that it took me so long to approve it.